Learn about our partners, Solve For Why and sign up for the May academies using coupon code Justhands2019! Sign up for Solve for Why TV and get 5% off anything in the store with coupon code Justhands2019! Hero raises to 45k with Qs9sKcTh. Villain calls. Villain checks, hero bets 60k, villain raises to 210k. Hero? Learn about our partners, Solve For Why and sign up for the March academies using coupon code Justhands2019! HJ (covers) raise to 20, BB (710) 3bets to 60, HJ 4bets to 160, BB calls. Check out Travis on the RCP Podcast! UTG1 limps, button limps, BB hero AhJc 35. Just BU calls. H 125, V raises 250, hero? Tune into the stream every day at 8 PM EST! Folds to hero (covers) in the CO who opens Q6cc to 30c. Both blinds call. SB (3.83 to start) bets 45c. Both players call. SB bets 1.12. Folds to hero who calls. SB shoves for 1.96. Hero? Learn about our partners, Solve For Why! Christian opens KdTc UTG to $50. Kristen Bicknell 3bets to $200 from the HJ. Folds to Christian who calls. Christian leads for $500. Bicknell folds. Folds to Christian in the first straddle who calls. Bicknell raises to $140 in the second straddle. Christian calls. Checks to Kristen who bets $100. Christian calls. Christian checks. Kristen bets $200. Christian raises to $700. Bicknell calls. Button is straddler. One limp in MP. Chris Moneymaker raises to 50 in HJ. Hero looks down at KdJc. Hero raises to 120 in CO. Folds around to CM who makes the call. CM checks, Hero bets 110, CM raises to 260, Hero calls. CM jams all in for 1600. Hero? $1/$3, Jack Casino, Tuesday night before Thanksgiving, 6:30pm. Hero and villain have a very similar stack of around $750 give or take $25. Villain is in his 30s, caucasian with beats headphones, Indians hat neatly trimmed beard. I've only been at the table for a short amount of time so I don't have too many notes when this hand occurs, but he seems like a TAG. Hero is new to the table, and the room (I've only played there a couple times in the past so nobody knows me). Similar 30 something caucasian male. My image so far is very LAG. I've only been at the table for 25 minutes but I've been playing most hands and in that time I've worked $300 to $750. I recently won a big-ish pot with Qs4s when I opened pre from MP, flopped top pair, turned flush draw and rivered 2 pair. Table has been talking about this since as if I'm the craziest MF to ever exist. I, however, have chosen to remain silent. We're UTG+2. UTG+1 limps, I have Jh9h and I make it $15. Folds to villain in SB who makes it $45. UTG+1 folds. I flat. Villian fires $45. I decide to call. Villain thinks for 5-8 seconds and fires $110. I decided to min-raise to $220, expecting a call, as that would set up a nice river shove opportunity barring a heart. Villain very quickly asks "Oh, you have queen four again?" Before asking how much it is, and then sliding in a call. Final board is now Qh2hQc6h6d and we have the J high flush. Villain shoves his remaining ~$350 in. His bet timings have been very similar on each street, so I can't rely on that tell. He's doing good with the stoic thing too. Hero? 1k effective. Young Man Coffee opens to $20 in the HJ. Button, and SB call. Hero calls in the BB with 6s5s. C to YMC who bets $55. All players call. YMC bets $180. Button folds. SB and hero call. Check Out Tommy Angelo's Waiting for Straighters! MP1 (650) opens to 12, HJ (150) calls, Hero (425) calls in the CO with KhTs, Button (2.5k) calls. MP1 checks, HJ checks, Hero bets 15, Button calls, MP1 raises to $30, Hero calls, Button calls. Checks to button who shoves, MP1 calls, hero? V opens $20, H calls with JTss, heads up to the flop. $3/$5 Full Ring $300 max bet. UTG2 limps. HJ opens to $20. CO calls. James ($500, is effective stack) calls with 8h8s in the SB. BB and limper call. Checks to HJ who bets $45. Hero calls. HU to turn. James checks, HJ bets $75, Hero? Fausto (1200) opens UTG2 to $30 with AdQc. HJ (1000) Button (1000) and BB (1200) call. BB bets $65, hero raises to $180, folds to BB who calls. Checks to hero who bets $300, BB shoves, hero? UTG1 ($2000) opens to $25. Hero ($890) calls with KcJs in the CO. Button ($1100) calls. UTG1 checks, hero bets $50, both players call. Checks to hero who bets $150, Button calls, UTG1 folds. Hero checks. Button bets $310. Hero? Hero (covers) opens red aces to $40. CO (700) Button (2k) and BB (2k) call. BB leads $150. Hero calls, CO folds, and button calls. BB leads $100. Hero calls. Button calls. BB bets $100. Hero calls. Button raises to $900. BB folds. Hero? Folds to Michael (550k) OTB who raises to 45k with AJhh. Maria Ho (900k) defends BB. Maria checks, Michael bets 30k. Maria calls. Learn more about beyond tells! Check out our guest Matt Vaughan’s poker vlog! UTG and UTG1 limp. Matt (43k) limps T9dd from UTG2. SB calls and the BB checks. Checks to UTG1 who bets 700. Matt calls. BB calls. Checks to Matt who checks back. BB leads 3200. UTG1 folds. Hero? SB checks, BB bets $35, John calls, button calls, SB folds. BB checks, John bets $120, Button raises to $325, BB folds, John? Learn more about this week's guest Jen Shahade! Jack (15k) opens MP to 1500 with KdKx. HJ (25k), CO, Button (covers), and BB call. Checks to HJ who bets 3500. CO folds. Button raises to 8000 (possibly a misclick). Folds to hero? Peter (2k+) opens AsQc MP1 to 20. LP (250) calls. Button (2k+) raises to 65. Peter and LP call. Peter checks, LP bets 100, button calls. Peter? Check out Kristy’s amazing WSOP vlog! Want to beta test the Solve For Why training site? Send an email to applications@solveforwhyacademy.com with subject “Beta Test Training Site” to sign up. MP opens to 1200, next to act calls. Folds to Kristy who calls in the BB with Q2dd. Effective stacks are 25k. MP bets 1500. Both players call. MP bets 3k, MP1 folds, Kristy calls. Kristy checks, villain shoves. Kristy? Check out “Results May Vary”, the new S4Y WSOP vlogumentary. EP limps, Peter ($2300) opens 66cx to $40, BB calls, EP calls. Peter is effective stack. Checks to Peter who bets $90. BB raises to $290. EP folds. Peter calls. BB raises to $440. Peter calls. Nik (covers) opens to $20 in the HJ with QJdd. Button straddler 3bets to $55 ($950). Folds to Nik who calls. Hero bets $60. BU calls. Checks to BU who bets $25. Hero raises to $80. BU 3bets to $180. Hero calls. Hero checks. BU bets $300. Hero calls. Hero checks. Villain visibly sighs and goes all in. Hero? MP limps, Hero ($210) limps HJ with 76cc, CO ($197) limps, button folds, SB calls, BB checks. Checks to CO who bets $10. MP calls, Hero calls. Checks to Hero who bets $16. CO raises to $45. MP folds. Hero? UTG1 ($400) limps, UTG2 ($2000) calls, Hero ($1300) calls in the BB with JhJd. Hero bets $30. Folds to UTG2 who raises to $80. Hero raises to $200. Villain raises to $450. Hero? UTG limps, Hero ($200) raies to $10 UTG1 with JTss, LJ ($200) calls, HJ through UTG all call. Hero bets $50, villain calls. Learn about our new partners, Solve For Why! 7-handed. O’Neil (43k) opens KQo UTG. Choi (370k) calls Q4s in the SB. Matt (116k) calls A6cc in the BB. G-Man (340k) calls J7hh in the Straddle. Choi leads 5.5k, Matt calls, G-man raises to 23k, folds to Matt who calls. Matt checks, G-man bets 50k, Matt? For More Just Hands Content! 6-handed.Frank Kassela (62k) opens A2dd in the HJ to 800. Nick Shulman (120k) calls Q9ss in the co. JRB (229k) calls KcJd otb. Blinds fold. Kassela checks, Shulman bets 1500, JRB calls, Kassela folds. Shulman bets 3600, JRB calls. Check out the Solve For Why Heads Up Poker Charity Tournament! MP limps ($300), Button opens to $10 ($350), Hero is in BB and calls with AdQc ($370), MP calls. Checks to Button who bets $20. Hero raises to $50. MP folds, Button calls. Hero bets $110, Button calls. Folds to CO (180k) who opens to 10k. Jack (100k) calls in the BB with Ah9s. Jack checks, CO bets 12k, Jack calls. Zach bets 30, BB raises to 85, Zach calls. 5-handed. Jack opens UTG to $50 with KTdd. CO calls. HU to flop with effective stacks of $1500. Jack bets $40, CO raises to $140, Jack calls. Jack leads $240, CO raises to $600, Jack? 9-handed. Two EP limpers. Peter opens CO to 35 (2700). Jack calls with KsJd (2400). BB (1600) calls. One limper calls. Checks to Jack who bets 80. BB raises to 240. Jack calls. 9-handed. UTG ($250) opens to $13. Folds to hero (covers) OTB who raises to $45 with KK no club. Folds to UTG who calls. UTG bets 45. Hero calls. Check out the last Solve For Why Vlog featuring Jack and Zach! UTG limps. Jack opens UTG1 to $30 with red AK. MP calls. HU to the flop. 700 effective. Jack bets 45. Villain raises to 150. Jack calls. Jack bets 125, villain calls. Folds to Zach (500) who opens K6dd to 8 in the CO. Button, SB, and BB call. Zach is the effective stack. Checks to Zach who bets 25. Button calls and the blinds fold. Zach bets 80, villain calls. Villain leads $85. Hero calls. Peter opens AsAd to $20 in MP. Villain calls in the BB. Effective stack is $1000. Villian checks, Peter bets $30, Villain calls. Heads up. Hero ($600 effective) opens to $9, Villain 3-bets to $30, Hero calls. Villain checks, Hero bets $40, Villain calls. Villain bets $80, Hero raises to $210, Villain jams, Hero? UTG1 ($800) opens to $20, Hero (cover) raises to $80 in the LJ with 54cc, UTG1 calls. UTG1 checks, Hero bets $65, UTG1 calls. UTG1 checks, Hero bets $115, Villain calls. UTG1 opens to 15. Hero 3bets QhQd to 44 from the BB (1100 effective). Hero bets 70, Villain raises to 210. Hero? Check out the footage from our LA event! Hero opens AThh in the HJ to $15. CO ($350) calls, BU ($450) calls, both blinds call. Checks to hero who bets $30. CO raises to $60 and button quickly calls. Blinds fold. Hero? Dave Mills opens to $20, UTG1 calls, Button calls, Jack calls in the BB with 97s. Checks to button who bets $40. Jack raises to $165. Folds to button wh calls. Hero bets $125, Villain raises to $250, Hero? Hero bets $35. Button calls, others fold. UTG ($2k) opens to $20, 3 callers including button ($400). SB ($1000) 3-bets to $100. Jack flats in BB with TT and covers. UTG flats, folds to button who shoves. SB folds, hero? Hero bets $20. Villain calls. Hero bets $50. Villain raises to $150. Hero? For more information about our NYC event! For more information about or event with Live at the Bike! Checks to hero who bets $30. Fold, BB calls, LJ folds. Villain leads $40, hero calls. 10-handed, UTG limps, UTG+1 ($1000) limps, UTG+3 ($330) limps, hero ($300) raises to 20 holding KdJd. Everyone folds except UTG+1 and UTG+3, who both call. Checks to hero who bets $40. UTG+1 calls. UTG+3 folds. Check, Hero bets $30, Villain raises to $95, Hero? UTG raises to 15, UTG1 ($2500) calls, MP1 calls, Hero is in MP2 w ThT77 ($1400) and calls, CO calls, SB ($1000) calls, BB calls. 7 ways to flop. Turn (780) 3s. UTG1 bets $700. Hero? 9-handed. UTG straddles $6 with a rock. 3 players limp. Hero limps behind with J4s OTB. Both blinds call. Straddle checks. BB ($70) leads $15. MP ($120) limper calls. Hero (covers)? 7-handed. A couple of EP players limp. CO raises to $12. Hero is OTB with QQ and raises to $35. Folds to CO who calls. Checks to Hero who bets $75. CO c/r all-in to $270 total. Hero covers. Hero? UTG opens to $21. Hero is holding QsQx and raises to $65. Folds to UTG who calls. Hero is effective stack with about $400. Effective stack is $1200. Hero opens to $20 with KK. 3 in position players and both blinds call. Checks to hero who bets $80. All in position players and 1 blind call. Checks to Hero who checks. Next to act bets $135. Folds to button who calls. Folds to Hero who calls. $1500 effective. 4 limps to Hero in CO with A6ss. Hero calls. Fish OTB raises to $30. All limpers including Hero call. BB leads $35, hero and button call. BB checks, Hero bets $135, Button shoves about $360 total, BB folds, Hero? 7-handed. Limps to Zach in HJ who limps behind with AsQs5h4h. Folds to reg in SB who raises to 30. BB folds. First limper calls, second limper folds. Zach calls and is the effective stack with $620 behind. Checks to Zach who bets $85. Both players call. Checks to Zach who bets $125. SB calls, UTG folds. Jungle bets $7000, Rast raises to $38k, Jungle shoves, Rast? Check out the premium podcast with Tommy Angelo! EP opens to $15, MP calls, Tommy calls button, Jack ($810 eff) raises to $100 in the SB with A8cc, folds to Tommy who calls. Jack bets $180, Tommy raises to $400, Jack? EP limps, Hero ($1600) opens to 30 in the lojack with 66, HJ ($2600) calls, Button ($1200) raises to 80, folds to Hero who calls, HJ calls. Checks to button who bets $200, Hero calls, HJ folds. Hero leads $275, button calls. UTG and UTG1 limp. Hero ($350) limps Q2hh. Villain ($210) limps in CO. Button limps and blinds call. Checks to Hero who bets $10, Villain calls, the rest fold. Hero bets $25, Villain calls. Hero bets $25, Villain shoves $173 total, Hero? Folds to Hero ($1200) in the LoJack who opens to 20 with QJo. Folds to pro in BB who calls. Hero is effective stack. BB leads $100. Hero calls. Villain jams for $1080. Hero? Checks to HJ who bets $250. Folds to Hero who calls. UTG+1 ($20) Opens to $.60, Hero ($30) raises to $1.20 with 44 OTB, SB ($30) flats, UTG+1 calls. SB bets $2.10, UTG+1 folds, Hero raises to $6, SB calls. Hero opens to 25 UTG with JJ. Button and BB call. Button starts hand with 2100 and hero covers. Hero checks, Button bets 250, Hero raises to 625, Villain shoves for 1930 total, Hero? Hero (covers) raises to 20 in the LJ with KcJh, CO (650) calls, BB (1000) calls. BB checks, Hero bets 35, CO calls, BB calls. BB bets 200, Hero folds, CO folds. Zach has an intimate interview with Kenna James on life, coaching, and some of the finer points of spirituality. CO (450k) opens to 31k, Hero (600k) calls in the SB with KTo, BB (400k) calls. Hero bets 85k, BB calls, CO folds. Hero bets 150k, BB calls. Hero checks, BB bets 26k, Hero folds. One EP limper, Hero (200k) raises OTB with 63dd to 1400, SB (50k) 3bets to 6000, Hero calls. Villain bets 7k, Hero calls. Villain bets 14k, Hero calls. Villain checks, Hero shoves, Villain folds. Hero (Covers) raises UTG to 20 with 88, Villain (1000) UTG+1 raises to 60, SB (300) calls, Hero calls. SB checks, Hero checks, Villain bets 80, SB folds, Hero calls. Hero checks, Villain bets 400, Hero? CO (1500) raises to 20, Villain OTB (600) calls, SB calls, Hero (covers villain) raises to 120 with KQo in the BB, CO folds, BTN calls, SB folds. Hero checks, Villain bets 10k, Hero calls. Hero bets 12k, Villain calls. Hero (covers) raises to 10 in the CO, Villain 1 (~850) calls in the SB, Villain 2 (~850) calls in the BB. Villain 1 bets 30, Villain 2 calls, Hero raises to 90, Villain 1 calls, Villain 2 calls. Villain 1 bets 100, Villain 2 calls, Hero calls. Hero (Covers) raises to 35 in the BB, Villain (870) calls from UTG, Button straddle calls. Hero bets 75, Villain calls UTG, Button folds. Hero bets 200, Villain calls. Villain raises to 30 OTB, Hero 3bets to 120 in the SB with AQo, Villain calls. Hero checks, Villain bets 100, Hero raises to 290, Villain calls. Hero checks, Villain bets 125, Hero? Hero checks, Villain bets 15,000, Hero? Use the Discount Code Mentioned in Today's Episode to get a Discount on Tommy Angelo's New Release! BB checks, Hero bets 680, BB shoves, Hero? Villain bets 2/3 pot, Hero? Can you guess what villain had? Write in to jack@justhandspoker.com to submit any guesses. Any correct answers will receive a shoutout on the next episode. Checks to hero who bets 30. Both villains call. 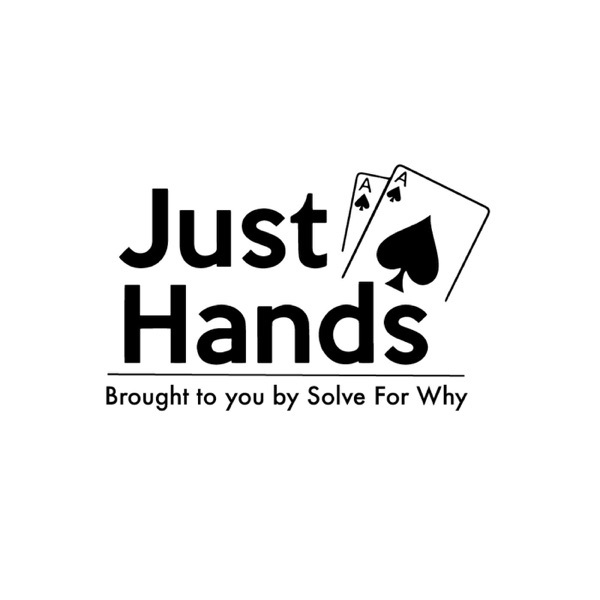 Welcome to the Just Hands Podcast where we break down a hand of low-stakes, live NLHE cash each week. This week we welcome guest Daniel Negreanu for a special hand and an interview. Hero checks. Villain bets 25. Hero? Preflop: UTG+1 Posts and checks, Hero raises to $12 in MP with AA, Folds to UTG+1 who calls. 200 eff, Hero covers. Checks to Hero, Hero checks, MP bets 165, folds to Hero who calls. Villain bets 200. Hero calls. Villain shoves for 635. Hero? Turn T (3300): Checks to hero who shoves. Villain (2100) opens to 70 UTG+1, Hero (2900) calls in HJ (hand intentionally not revealed), folds around. Villain Checks, Hero bets 135, Villain raises to 425, Hero 3bets all-in, Villain calls. Jessie bets 2100, MP raises to 5800, CO folds, Jessie? Thank you all so much for being a just hands listener as we round into our second year! Tom Marchese opens to $150, Matt 3-bets to $500 with JJ, Jennifer Tilly calls in SB, Marchese calls. Tilly is effective stack with 22k. Villain1 is 30-year-old or so woman. Playing pretty well for several hours, from what I could tell. One of the better players on table, from what I could tell. I have about $1500 and she has $1100. Villain 2 is a loose young guy seen semibluffing. Preflop: Villain 1 raises to $35 UTG+2. Hero calls ATss (no diamond) behind. Villain 2 calls small blind. Big blind calls. Flop Ad Ts 6d (140) Villain 1 bets $100. Hero calls. Villain 2 in SB calls. BB folds. Turn 5c (440) Checks to hero who bets $250 into $440. Villain 2 folds. Villain 1 calls after pretty good pause. River 7s (940) Villain 1 immediately, within couple seconds, says, “$700.” Pot was $940 (minus $5 rake). UTG (80k) opens to 1700, B (32k) calls, Hero (60k) calls in the BB AdQs. Hero bets 2500, UTG calls, B folds. Hero bets 6500, villain raises to 22500. Villain (500 effective) limps UTG+1. Hero (covers) makes it 10 in the BB. Villain makes a speech and makes it 30. Hero makes it 80. Villain makes it 180. Hero calls. Hero checks. Villain ships for about 320, Hero calls. Checks to Hero who bets 10, main villain calls, UTG folds. Hero open for $12 utg+1 (covers) with KK. MP ($500) calls. Everyone else folds. Hero bets 15, villain min-raises to 30, Hero makes it 60, villain calls. For more great content, head to www.justhandspoker.com Location: Bellagio Stakes: $5/10 MP (1500) limps, Hero (5k) makes it 40 in MP+2 with A3s, Button (5k) makes it 140, BB (2500) calls, Hero calls. Flop (430) AhJs3h BB checks, Hero checks, Button checks. Turn (430) 5s BB leads for 260, Hero calls. River (950) 9d BB bets 450, Hero calls. Folds to Hero (Greg Raymer) in MP who minraises with pocket 9s. Folds to the SB, a successful pro who reraises to 6BB, a 3x raise. Greg tanks then ships. Villain calls. Villain limps UTG, Hero (220) makes it 12 with KQo, MP calls, Button calls (covers and is main villain), BB calls, UTG calls. Checks to Hero who bets 30, MP folds, Button calls, BB and UTG fold. Hero bets 65, Villain calls. Hand 1: Everyone has about 500 behind UTG limps, UTG+2 limps, MP+2 limps, Hero is in CO with QhJc and limps behind, SB completes and BB checks. Checks to Hero, bets 20, everyone but the SB calls. Checks to MP+2 who bets 25, Hero calls, everyone else calls. Checks to MP+2 who bets 25, Hero folds, BB and UTG fold, UTG+2 calls. Hand 2: Everyone besides SB has about 500 behind UTG limps, three more limpers, SB (1000) makes it 25, Hero makes it 85 with AKo, UTG insta makes it 190, Hero folds. Here at Just Hands Poker we're all about the in-depth hand analysis. So in the past when we've had interesting guests on and had some nice conversation not directly about poker or the hand we're discussing, we've typically cut that from the episode. For this week we tried something new - instead of cutting my discussion about the shared love of board games Ryan and I have, we've released it as a separate episode, 36b. So if you want just the hand in the spirit of the show, listen to just 36a. But for those of you who are curious about which board games Ryan and I are passionate about, we've got a short 10 minute mini-episode for you. This is something we're considering doing for all future guest episodes so we'd love to hear your feedback on what you think! TLDL: Zach and Ryan really like board games - people should try playing the game diplomacy with a bunch of friends. UTG (100) makes it $7, MP (150) calls, and two deep stacks (800) call in LP. Hero (800) completes the extra 4 in the BB with 65o. Main villain is UTG and is on his second minimum buy in, and has been playing a wide range of hands mixing up limping and raising. Hero checks, Villain bets $15, one deep stack calls, Hero calls. Turn (80) A bringing in a flush draw. Hero checks, Villain bets $20, MP player folds. Hero ships for $60 effective on top. Villain tank calls. Stakes: $2/5 Villain seems to be a very ABC player. Preflop Hero ($400-500 behind) button straddles to $10. Hijack opens to $30. Hero calls $20 OTB with 52d. Villain checks. Hero bets $25. Villain calls. Villain checks. Hero bets $20. Villain raises to $60. Hero shoves. Villain folds. Villain 1 is an older man, very few reads. Villain two has been very sticky with poor preflop hands. Full Table Villain 1 (800) opens to 15 UTG + 2. Hero (900) calls with A7 of diamonds. Folds. Villain 2 (700) calls. Flop (45) KQ7 two diamonds. Villain is a young kid with a big stack who has made some wildly bad calls and won big in the short time our Hero was able to view his play. Table is 5-handed Hero (300) opens to 12, UTG with K8c. Older man in UTG+1, who has a VPIP of 0 in 8 hands, calls. Villain calls in the BB. Everyone else folds. Villain donks for 12. Hero shoves for 288. Older man calls. Villain folds. Villain is a consistent limper who has donk bet on 5 out of 6 hands he has limped into previous to the current hand. Preflop Hero (315) is on the button with TT, facing two limpers including the Villain in the hand. Hero makes it 20. Villain (has Hero covered), who limped, calls in the lo-jack. Villain donk bets 35. Hero calls. Villain leads for 30. Hero calls. Villain checks. Hero bets out for 50. Villain raises to 150. Hero calls. Two limps, first limper very fishy player (300), Hero (900) completes in SB with K3d, BB, a relatively competent younger player (600) checks. Hero bets 20, BB and first limper call. Hero checks, BB bets 45, limper makes it 90, Hero raises to 300, BB shoves, first limper folds, Hero calls. Five limps to the SB, Hero (350) makes it 26, EP limper (175) calls. Hero checks, villain checks back. Hero bets 30, villain calls. Hero bets 55, villain shoves, Hero calls. Hero opens AQc UTG +1 for 17 after an UTG limp. MP calls, CO the main villain who is a very aggressive player Hero has already hero-called down this villain correctly shortly before calls, BTN calls and UTG closes action. Checked to the CO who bets 50, Hero calls. Hero checks, villain bets 100, Hero calls. Hero (130) makes it 17 UTG with AhKc, UTG+1 (49) calls, UTG+2 (120) calls, button (200) calls. Hero bets 22, UTG+1 ships for 32, button calls, Hero calls additional 10. Hero checks, villain bets 50, Hero calls. Hero goes all in for remaining $31, button calls. Main Villain (234) raises to 12 in UTG+1/HJ, one caller OTB, Hero (715) calls in the BB with K9c. Hero checks, Villain bets 20, caller folds, Hero calls. Hero bets 55, Villain raises all-in, Hero calls. Three players limp, Hero (1000) makes it 35 with A8s in the CO, SB (1500) calls, BB calls, one of the limpers call. SB leads for 55, BB and limper fold, Hero makes it 155, villain makes it 350, Hero calls. Villain shoves, Hero calls. Villain tables 72o. Episode 25: When to bluff the tilted old man? Checked to Hero who bets 40, Villain 1 insta-check raises to 100. Villain 3 folds Hero calls. Villain bets 100, Hero calls. Villain bets 100, Hero raises to 205, Villain folds. 9-handed table 6 limps to the Hero (1200) in the straddle with 104s, Hero makes it 75, villain in the HJ (1000) calls. Hero checks, Villain bets 200, Hero calls. Hero checks, Villain shoves for 700 effective. Hero calls. Episode 23: Can Zach fold top pair? 8-handed table at the time Zach (725) opens to $2/5 MP with J10c then two fairly loose passive villains call. One in CO has 350 to start the hand and the one OTB has over 1000. Hero bets 40, both villains call. Hero bets 115, villain in the CO shoves for about 275 and then the button goes all in too. Hero folds. 8-handed table at the time. Zach opens to $2/5 UTG with K10s, two loose passive villains call and then Zach's student calls in HJ with pocket 8s (Hero). Main villain in hand, loose aggressive player that keeps talking poker strategy makes it 120 in BB, Zach and two other villains fold, Hero calls. Villain cbets 155, Hero calls. Turn (605) offsuit Jack completing the rainbow. Villain leads for 250. Hero folds. 8-handed table at the time. Two limps by two loose passive players in EP and MP, Hero makes it 35 with Q9h OTB. Main villain, new player at the table, flats in SB and the next two players call. Villain verbally declares 80, next two villains fold, Hero calls. Villain bets 110, Hero folds. Episode 20: Fold overpair to TAG's aggression? Main Villain: Thinking TAG (250) that's not afraid to mix it up makes it $6 UTG. Loose fit or fold player calls UTG+1 (80). Hero makes it $16 OTB with black tens, SB - a new player to the game who has thus far played crazy calls, other two players call. Checked to Hero who bets $36, folded to main villain who makes it $110, Hero folds. Episode 19: Flat Aces Preflop? Tag Pro 1 (500) limps UTG, Tag Pro 2 (1500) limps in MP, tilted Main Villain (230) makes it 30 OTB, Hero (700) flats in the BB with aces. Both other players call. Checked to the preflop raiser, he cbets 90, Hero makes it 200, everyone folds. Straddled pot. Two straightforward weak-tight players limp the straddle in early position. First villain has 600, second player has 550 behind. Hero makes it 65 in the CO with Q9d, both villains calls. Checked to Hero who bets 140, V1 Calls, V2 makes it 350. 3rd hand of the night, all stacks are aproximately $100. Main villain in this hand a somewhat loose agressive player that Hero thinks is one of the more competent players in the game. 8-handed table Two limps in late position, SB checks, Hero checks in the BB with A10o. Checked to 3rd player who bets 3, Hero calls. Hero leads for 6, villain calls. Hero leads for 6, villain raises to 12, Hero folds. Folded to the button who limps, Hero makes it 10 with two red kings, BB calls after remarking he would have raised, button calls. Hero bets 20, BB raises to 40, button folds, Hero calls 20. Hero checks, BB bets 70, Hero calls. Hero checks, BB shoves, Hero calls. Main villain is a somewhat loose and aggressive 50 year old. Folded to Hero OTB (200) with K3c and raises to 10, SB calls, and villain (covers) calls in the BB. Checks to Hero, and Hero bets 18. BB raises to 40 and Hero calls. BB thinks for a while and leads out for 50. Hero calls. Villain quickly checks. Hero shoves for remaining 100 and villain calls. EP (200) limps, straightforward player with no real reads. Main Villain CO (700) opens to 12. Villain is competent post-flop but has been playing very wide pre, especially in position. Hero HJ (700) calls 12 with AQo. Limper calls. Villain bets 12, Hero makes it 45, Villain calls. Turn (120) 4c putting a club draw out there. Hero bets 90, Villain quickly calls. Villain leads for 180, Hero folds. BB (640)- Main villain: A true LAG, 30yo, deep pockets, from a Middle Eastern country, has played much higher stakes in Macau, whose calling/limping/raising ranges are much wider than mine, but has a knack for crushing whales and TAGs alike. His favorite place to be is deepstacked with a suited hand against a straightforward player. He often plays wide, linear ranges, rarely misses value, and picks pretty good spots (and sizings) to bluff. Despite his reputation, he bluffs enough when he is winning. This guy's style is sticky and unorthodox but his strengths usually make up for his many leaks and 'that's not in any poker book' moves. Hero is OTB (covers), a big winner historically, playing a looser style than usual, having shown a few big bluffs already. SB (220) local, a moderate winner very loose pre. CO (250) businessman who plays straightforward fit or fold. HJ, MP, MP, EP, EP, EP all a juicy mix of players looking to hit top pair, who have between 160 and 500 behind 4 limps to Hero on the button, Hero and limps behind with 810o. SB completes, BB raises to 10, 3 folds, CO calls, Hero calls, SB folds. BB Cbets 30, CO folds, Hero raises to 90, BB calls. BB checks, Hero bets 120, BB calls. BB leads for 200, Hero folds. Villain 1 UTG (1000) raises to 20, which was standard for the table. This player is a 'hyper LAG'. He's experienced and aggressive but Hero doubts he's ever read a poker book/watched a training video/been active in poker forums. Villain 2 UTG+1 (600) calls. 1-2 reg, late 40s. Hero has played with him but never at 2-5 before. He's limpy-cally preflop and fit or fold but sticky post. Villain 3 OTB (220) calls. He has bought in for the max of $500 twice now but only has $220 remaining after losing a stack, buying back in for 100bb and bleeding off a bunch of chips calling pre and folding to cbets and value owning himself. This player is a retired lawyer around 65. He's an experienced player that plays like an old-school TAG, but is capable of semi-bluffing and bluffing when he senses weakness. Hero in the BB (380) calls the remaining 15 with JsJd. Hero checks, UTG bets 50, UTG+1 folds, Button calls, Hero calls. Hero checks, UTG checks, Button ships for remaining $150, Hero calls, UTG folds. Button has AK and the river bricks. Villain 1 UTG+1 (700) raises to 7. Hero has observed that this sizing is weighted towards his medium strength hands and is likely to fold to a 3-bet. This middle-aged recreational player has also been very loose over the last hour and a half of play and has been on a heater. Villain 2 (700) calls OTB. Observed to be a very good player for 1/2, bought in for the max (400). Called Hero down light before and was good. Hero in the BB (600) makes it 30 with A4s. Villain 1 folds, Villain 2 calls. Hero check calls a bet of 45. Hero check folds to a bet of 140. All villains have hero covered. Villain 1 UTG limps: mid-30s recreational player, has limped a lot preflop before and has been observed donk betting with draws twice. Hero (600) is UTG+1 with AKo (no spade) and makes it 20. Villain 2 OTB flats: tight older player. Villain 3 calls in the SB, wearing scarf. Villain 1 calls. Villain 1 leads for 25, Hero makes it 75, Villain 2 OTB makes it 175. Villain 1 calls, Hero calls. Check Check, Villain 2 bets 140. Villain 1 folds, Hero calls. Villain 1 (1150): Villain: looks like a competent player but very aggressive opens in MP+1 to 30 (standard opening size). Hero (2000): Brent, mid-20s grinder 3-bets AKo (with no spade) to 85. Villain calls. Villain checks. Hero bets 115. Villain calls. Villain checks. Hero bets 200, Villain shoves. Hero calls. Villain tables K10o, Hero's hand holds up. Villain later revealed to be Chad Power, successful poker professional and staker of many Maryland-based players. This episode featured special guest Brent Jenkins. He is a local pro based out of the Maryland Live! casino. Stakes: 2/5 9-handed table, round of straddles. Hero (700): Zach, younger male. Played about one hand in two orbits and then got a round of straddles started, and in the first six straddled hands has opened three hands. Villain 1 (500): Typical middle-aged recreational player, no real reads yet. Villain 2 (650): Late 50s male. Superstitious dealer from a nearby casino. Keeps referring to himself as an action player but has played loose passive pre and has played what looks like weak-tight postflop. V1 limps in EP, V2 over-limps in CO, Hero makes it 50 in the HJ with pocket 10s. V1 folds, V2 limp reraises to 200, Hero shoves, Villain folds pocket Queens face-up. Bad LAG (400) opens to 8 UTG, older german player calls, complete beginner calls, Hero (670) makes it 42 OTB with Aces. Tight woman (500) flats in the SB, everyone else calls. Checks to Hero, Hero bets 120. Tight woman tank calls, everyone else folds. Woman donks out 80, Hero calls. Check, Check. Woman tables KJs, Hero's hand is good. Hero (1200): Zach, younger male. Has been playing about 30 percent of hands due to a weak tight relatively short-handed table and a very good run of cards. Playing very aggressively pre and postflop with kind of a crazy image due to being on a recent heater but hasn't gotten to showdown yet. Villain 1 (400): Typical middle-aged recreational player, although a bit tighter and more apt to limp-fold than most. Villain 2 (700): Late 20s male. Looks and acts like a professional although has the propensity to tilt. Playing tight and aggressive and hasn't gotten out of line once even when there have clearly been spots preflop to do so. 7-handed table, round of straddles. V1 limps in EP, V2 over-limps in CO, Hero makes it 50 in the straddle with AJo with the ace of spades. V1 folds, V2 calls. Hero bets 80, villain calls. Hero bets 400, villain calls. Hero tables hand and is good. Hero (2600): Zach, younger male. Has been playing about 20 percent of hands. Playing very aggressively pre and postflop with kind of a crazy image due to being on a recent heater. Has shown a few semibluffs that have all got there by the river. A lot of people are adjusting by limp-calling instead of opening with most of their range. Villain 1 (1000): Early 30s male. He's been playing about 35% of hands, opening around 15-20% of that range and limp calling the rest. Hero and villain have within the last orbit played two huge pots where hero stacked him for 700 and then I doubled his 600 rebuy up the very next hand. Since those two big pots hero has also won two medium pots off him and he seems to have been getting more fed up with Hero. Villain 2 (800): 60s male. Looks like a standard weak tight reg. Has not gotten out of line thus far, and has almost never opened, limping about 30% of hands and folding most of those hands to an open unless he's gotten very good pot odds. Villain 3 (800): Early 30s male. He has been fairly loose passive preflop, but has shown down bluffs and floats postflop. V1 limps in UTG+1, V2 over-limps in LJ, V3 over-limps in HJ, Hero makes it 40 OTB with pocket fives (no club). V1 calls, V2+V3 fold. V1 checks, Hero bets 65, V1 calls. V1 bets 85, Hero calls. V1 tables pocket 2s, 5s hold up. Hero (2100): Zach, younger male. Has been playing about 20 percent of hands. Playing very aggressively pre and postflop with kind of a crazy image due to being on a recent heater. Has shown a few semibluffs that have all got there by the river. A lot of people are adjusting by limp-calling instead of opening with most of their range. Villain 1 (1300): Early 30s male. He's been playing about 35% of hands, opening around 15-20% of that range and limp calling the rest. Hero and villain have within the last orbit played two huge pots where hero stacked him for 700 and then I doubled his 600 rebuy up the very next hand. Villain 2 (900): Early 30s male. Looks like a solid TAG and local grinder. Has not gotten out of line thus far, and has not taken a bunch of what look like profitable squeeze plays in the BB or straddle when limped to him. V1 opens to 35 in MP+1, Hero flats on the button with Q9c, V2 calls in the straddle. V2 check, V1 bet 50, Hero calls 50, V2 folds. V1 checks, Hero bets 135, V1 calls. V1 checks, Hero bets 175, V1 insta-folds. Hero (600): Zach, younger male. Hero has been playing fairly tight aggressive thus far. Might look a bit over-aggressive to certain players but has rarely gotten to showdown and when he has, has been with strong value hands. Villain 1 (300): Just sat down, first hand. In early 30s, reeks of marijuana. Villain 2 (200): Also just sat down, first hand. In early 30s, reeks of marijuana. Villain 3 (300): Very loose, super passive preflop. Capable of semibluffing and making big hero calls postflop. Has gone up and down a lot this session. Villain 4 (120): 70s male. Very straightforward player, has never raised pre yet. The only hand he showed aggression postflop was where he flatted pocket aces and flopped a set. V1 and V2 limp, Hero opens to 20 with AJs in MP+1. V3 calls in MP+2, V4 calls in SB, V1 calls, V2 calls. V1+V2 check. Hero bets 25, everyone folds. Hero (600): Jack, younger male. Has been playing 12-15 percent of hands. Three betting often when entering pots. Playing aggressively. Has only showed down strong hands both in terms of pre-flop strength and contextual strength. Recently changed seats to target villains. Villain 1 (250): Friendly truck driver in his 40s or 50s. A regular. Recently won high hand jackpot for $400 (did not put it onto the table). Sees a majority of flops. Somewhat stationy. Seems to have an idea of how to play, but ignores it in favor of action. Villain 2 (700): Early 30s male. Plays even more flops than villain 1. Plays very aggressively. Very friendly. Has been at casino for 28 hours straight. Hero opens UTG to 11 with T9dd. Folds to V2 in the SB who calls, V1 in BB who calls. Hero: Younger male, has been playing fairly tight and TAGish throughout the session. Villain: Middle aged guy wearing a collared shirt. Definitely a regular, knew two people at the table and knew the dealers. Maybe played an orbit, played one hand and didn’t do anything notable. Villain opens to UTG+1 to 8, folded to Hero OTB who calls with A10s. Blinds fold. Flop (18) 10J10 no flush draw. Turn (18) 8 bringing in a backdoor flush draw. Villain bets 8, Hero makes it 30. Villain calls. River (75) The case 10 comes in. Villain bets 50, Hero makes it 180. Villain deliberates and calls it off with JJ.